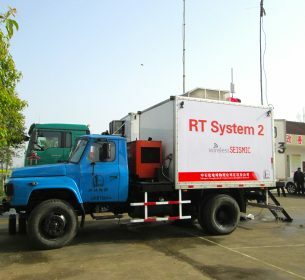 Wireless Seismic, Inc., the leading innovator of real-time and cable-free seismic data acquisition systems for the oil and gas industry, announced today the sale and delivery of its RT2 seismic data acquisition system to the Chinese seismic contractor, SINOPEC Geophysical Corporation (SGC), following extensive system trials in China. SGC combines a number of its former provincial geophysical companies and operates domestically in China and internationally in Asia, South America, the Middle East, and Africa. Wireless Seismic, Inc. is revolutionizing onshore seismic data acquisition with RT2, the industry’s only fully scalable wireless seismic recording system with real-time data transmission. Headquartered in Sugar Land, Texas, with offices worldwide, the company’s recording systems enable contractors to efficiently tackle the most challenging projects by delivering commercially compelling solutions for conventional surveys and passive monitoring for hydraulic fracturing. For more information, go to www.wirelessseismic.com. SINOPEC Geophysical Corporation is a wholly owned subsidiary of SINOPEC Group. SGC mainly engages in geophysical exploration services including geophysical data acquisition, processing, and interpretation. It boasts a host of solid capabilities in geophysical technology research, software development, and equipment manufacturing. Equipped with leading technology, advanced instruments, and an outstanding workforce, SGC serves as an international corporation delivering integrated geophysical services. Domestic seismic acquisition, processing, and interpretation services spread to all large exploration basins in China, overseas services have been performed in regions such as Middle East, Africa, Central Asia and South Asia, South America, in more than 30 countries such as Saudi Arabia, Algeria, Nigeria, Gabon, Myanmar, Ecuador, and Bolivia.